36 people dead – Deaths occurred till July 6! Upper parts of Pakistan, mostly Punjab and eastern Khyber are being continue to witness enhanced monsoon rainfall due to the interaction between western trough and monsoon current. Heavy rainfalls have occurred in Lahore, Islamabad, Faisalabad and other Upper parts of Pakistan since June 25, after a brief dry and hot period, second spell has once again started in those same areas. The heat conditions have relaxed down due to monsoon winds and cloudy cover. Temperatures till July 15 – Outlook! 41 °C to 43 °C in Sukkur. 40 °C to 42 °C in Nawabshah. 37 °C to 40 °C in Hyderabad. 32 °C to 34 °C in Karachi. Temperatures did rise in Sindh due to the break of monsoon by 1°C to 2°C but due to the second spell of monsoon in Punjab and Khyber the temperatures have once again decreased in these cities of Sindh. Partly/mostly cloudy with windy conditions is also decreasing the temperatures. 34 °C to 39 °C in Lahore. 33 °C to 38 °C in Islamabad. 38 °C to 41°C in Multan. 41 °C to 45°C in Faisalabad. 37 °C to 41 °C in Peshawar. Temperatures will rise in Punjab and Khyber as second monsoon spell will end in 2 to 3 days. 36 people have died since June 25 in Pakistan till July 6 due to weather related incidents. The deaths occurred due to heat waves, monsoon rainfall and river floodings. The death toll may rise as mature monsoon stage is yet to come to Pakistan. Pakistanis should take precautions during any severe weather event. Rain, rain and rain in Upper Pakistan! Low might form in Bay! A depression ARB 01 formed during early June, that caused no rainfall in Pakistani territory. A deep depression BOB 02 formed in the Bay of Bengal during mid-June that brought monsoon currents to Punjab. It created the first monsoon spell of 2011. A low pressure formed over Madya Pradesh that caused an isolated thunderstorms to form over North-eastern Punjab. A low pressure formed over Bay of Bengal, that brought second spell of monsoon to Punjab. Scattered light to moderate rainfall with isolated heavy rainfall likely in Islamabad and Punjab including Lahore, Faisalabad. While scattered light rainfall with isolated moderate rainfall in eastern Khyber including Peshawar. South Punjab, that is Multan city will also get rainfall. Western trough has also enhanced this activity over these areas. This spell will continue till 2 to 3 days, after that a break will follow and once again another third spell will occur in these same areas. In Karachi, partly cloudy to mostly cloudy skies likely till 2 to 3 days, drizzle may also occur during this period. Winds will be between 32 kph to 40 kph in Karachi. According to some models and numerical forecast, isolated monsoon rainfall may occur in Upper Sindh including Sukkur during 2 to 3 days, according to these models, monsoon may advance into upper parts of Sindh, after some break of monsoon it is expected that monsoon will eye Karachi and coastal Sindh, but that is just being expected as of now. However, it is yet to advance into south-eastern and coastal Sindh. Pakistan Weather Portal (PWP) has forecasted in May that monsoon will hit Karachi around July 15 , decrease or increase in days can not be ruled out! Whats next! – probably third spell? People of Indian-subcontinent, that follow weather, have eye over Bay of Bengal once again. Another low pressure might form in the Bay of Bengal that would enhance the monsoon activity over Indian-sub continent. The low might form in 4 to 5 days, it might bring third monsoon spell to Upper parts of Pakistan. So keep your umberalla ready Punjab and Khyber! ← Monsoon rain of July 28, 2010 – Dark day, but more was ahead! No proper rainfall till July 15 as per latest forecast..
yaaar itx raining in sakkar yr hamare karachi main kab hogi? aaahhhh karachi ka itna acha mousam ho raha hai…..no sun just clouds 🙂 where did these clouds come from anyways???? Why daily downpours in lahore and whole punjab like Dhaka and Calcutta? We can only get to see these non-rain clouds thats it ! No cumulonimbus clouds this year ! bbc shows thundry shower tonight and light shower tomorrow morning….Is it correct…???? BBC map does not show any rain in karachi, BBC forecasts are not trustworthy but their maps are.. But south-eastern and upper sindh is experiencing cloudy activity during nights for couple of days, so rain chances are very slim but can not be ruledout completly. Plz let us know that as the satellite image of PMD showing that the clouds are covering sindh, do you think it might be some moderate showers in karachi tonight or tomorrow ? its seems like i think …..
Mirpurkhas m halki boonda baadi hui hai…karachi metro mirpurkhas city m heavy rain kab hogi???? bbc jhoot bol raha hai….pata chal raha hai k aaj barish nahi hogi……. light rain will occur tomorrow inshallah…! I think its clear..that BBC forecasts are wrong..their map is good…but there forecast is not accurate..
when there is a strong weather system over Gujarat-Sindh border..
in 2010 bbc forecast was 90% accurate,this year until now bbc forecasting is 90% wrong. monsoon system kahan tak puhuncha hai? One thing is sure that because of western disturbance karachi weather is hot and dry whole year. Western disturbance during whole winter gives rains to whole pakistan except karachi and sindh and during monsoon its interaction with easterly also give daily flooding downpours to punjab,nwfp and kashmir specailly lahore to islamabad. Karachi does not get any good rainfall in winter and thats why it will never get daily heavy downpours during monsoon like punjab,nwfp and kashmir? Even there is no name of rains over karachi this monsoon. During winter to monsoon and whole year karachi has only sunshine and hot weather and responsible is western disturbance. i wonder why you guys conclude things before they even start ? ;/ … tell me is their any expert here who can really understand the met data ? I think a low pressure is developing in BOB. Is it correct what Tarim informing ??? Yaar Allah Say Dua kero Karachi maen Bhe barish ho jaye gee…. No BBC and no other forecast is correct only Allah knows the best when will it rain in Karachi. InsAllah Soon. It will be better if you give us any link or when it is coming here ?? i think it is not identified by any met dept so how you say it is coming ?? Severe weather Warning For Gujrat………. BBC map is showing that monsoon currents increasing their intensity over western indian coast and in BOB from thursday. Yaar Tell me one thing !! Ke SINDH province Bay Of Bengal ke Raining System pe kyun apni predictions depend karta hah ? I still did not understand that ? and what will happen if strng Low pressure formed in Bob ! SINDH ke near to nai na Bob itni door hah yahan se to yahan koi farak nai parega LOw presure se ! NO RAIN IN KARACHI NO RAIN IN SINDH! If we depends on Bob ! Same question here, Karachi should get rains directly from Arabian sea like Mumbai and from western disturbance and like Lahore. BOB is too far and it usually die out while or before reaching karachi. PWP give a news about a fresh low in BOB on July 7, and hopefully it will form either on July 12 or July 13…. ye map daikho shayad kuch tmhain samjh ajaeeeeee…..
Can you please explain why there is a unusual clouds line curve over Pakistan ? The source is my observation, i just saw pakmet’s satellite image and i think that a low is forming in BOB. @DeMoN I was expecting this sort of reply. @KM do you also thinks that this is due to satellite malfunctioning? will this low bring rains to karachi ??? pakmet said that this weather system will make its way towards upper parts of pakistan under its influence punjab, GB, KPK and few areas of upper sindh get rains. I don’t think ke is year karachi me monsoon rains hongi,because ye new weather system which is forming in BOB, ye bhi upper parts mein jaega….previous yeal 5th july se monsoon rains start hogai thin, and this year no monsoon rain in karachi, love islamabad,hate karachi! Sad, you haven’t updated monsoon of Pakistan page today. Only few US models are showing that La-Nina will re-emerge again later this year….but many (almost all) disagree.. Most of the weather models are showing typhone in pacific and strong low in BOB, but the formation of typhone follow by low in BOB. It observed that Whenever typhone forms in pacific the moisture from BOB moves towards it and there is a break in subcontinent. 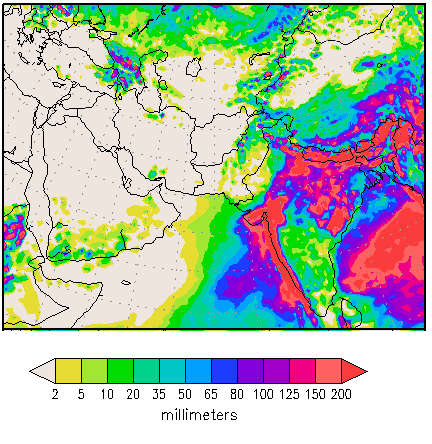 you can see map given in the above link, but its my observation that there will be no rain from the low in BOB(if typhone forms in paicfic)..
some isolated showers in Up sindh after July 15…. yar mjhe lagta hai low pressure kuch karega KHI mai q k Arabian sea ka temperature jo k june mai 26-28 tha 29 tak tu pohanch gaya hai…………. Matlab 2 Days mei Monsoons system BOB wala Upper sindh mei ya sindh province mei kahin pe bi enter hosakhta hah ? There was no rain forecast for the whole Country during previous 24hrs..But how the Hell (Low Rain occoured in Karachi???? it was not a drizzle it was and it is a low rain …. rain on Monday on BBC gfs very near. YESSSS LITE RAIN HAPPENING RITE NOW!!! 😀 awsum mousam!! babar bhai the 2nd week is almost starting and still no chances of monsoon rains in karachi??????????? raat ko humari taraf bohot taiz barish hoi, balkay city k mukhtalif parts me taiz barish hoi..
Monsoon will only start if some “mm” rainfall occurs in Karachi………….as of now only traces are being reported…..not one precipitation has touched “1 mm”……..
monsoon kahan tak puhuncha hai?aisa lagta hai k monsoon khi main gadhai per beth ker araha hai..
acha then what is happening right now? Moisture from the arabian sea? Now i want to see rains(of water drops). when will karachi get monsoon??? any Chances??? The direction of clouds is not Changing,,which changes due to monsoon…………… ut still cloudy Weather…. i am waiting 4 rain for about tgree weeks…… i want to see some real thunder rain with winds…………. jis city mein bullets ki rain horahi ho wahan allah ki rehmat kia barsey gi? forget rains in this stupid karachi,,, the most dangerous city in the world…. We will only see drizzle this year. there are thunderstorms in khi(gunfires) with heavy bloodfall. so there is no need of rainfall here in khi. Rain expected from 23rd july……. 1st weather system will bring good rain in karachi. which is reaching on 24 july. inshallah this time we will enjoy monsoon rain.